The Department of Veterans Affairs (VA), determines your eligibility for veterans education benefits. The Registrar's Office helps you take full advantage of the programs, services, and benefits. Upon acceptance to UCSC, you will need to contact the VA Certifying Official at the UCSC Registrar's office. 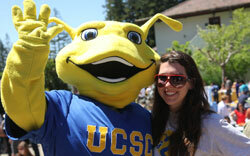 On their website, you will find a checklist of instructions for activating your education benefits at UCSC. Additionally, veterans should file the Free Application for Federal Student Aid (FAFSA) every year before March 2nd. Federal veterans educational benefits may be considered a resource in determining financial aid eligibility. Receipt of these benefits may result in a reduction of your Financial Aid. Note: Each student may receive one type of fee-paying grant or benefit. If you are eligible for both a Cal Vet Fee Waiver and another type of fee-paying award such as a Cal Grant, you will be advised to use the Cal Grant to pay your fees and reserve the Cal Vet waiver for use during summer and/or graduate school when you are no longer eligible for the Cal Grant. The Cal Vet Fee Waiver may only be applied to Summer Session fees if you are a continuing UC student. Below are additional resources available for our Veterans. The mission of the Smith Renaissance Society is to create a cross-generational community that provides academic, personal, social and financial support to UCSC students who lack the traditional family support afforded to most of their peers. Typically, these students have multiple adverse childhood experiences including, but not limited to, neglect, abuse, abandonment, or homelessness. Students may identify as being current or former foster youth, wards of the court, runaways, orphans, children of incarcerated parents, or children of parents with severe mental illness. STARS provides culturally responsive support to transfer, re-entry, veteran students, as well as students who do not have traditional family support due to experiences in the foster care system, with homelessness, abuse, parents who have been incarcerated, or other factors impacting their family life. We are comprised of professional staff members, peer advisers and mentors who are readily accessible to guide students on their academic journeys from pre-admission through their transition to UCSC, all the way to graduation and beyond.